It's time for another wonderful color challenge at the CR84FN Blog! Thanks so much to those who played along with out last challenge! 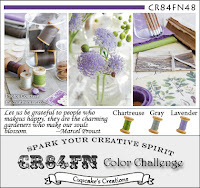 The colors for the next 2 Week Challenge are, Chartreuse, Gray and Lavender. I combined the Rose Corset and Butterfly (Butterfly Post) from Stampendous to create my card for this weeks challenge. I stamped the Rose Corset twice in Black Archival on White card stock, then cut just the Corset from one of the White panels and inked it with Ranger Pumice Stone Distress Ink. The Butterfly was stamped in Black Archival and cut from the design, then inked with Ranger Peeled Paint and Shabby Shutters Ink and highlighted with a White Gel Pen. I adhered the wings behind the cut Corset and applied to the base card, the added bits of Zva Creative Flourish Gems (Ice & Fire Crystal CR-03CA-109) and Lavender Transition Mini Roses (FLBK-03CB-121) and an Olive Mini Rose (FLBK-03CB-127). The pattern paper panel is embossed with a Texture Fades Folder. Here's this weeks color inspiration, we'd love for you to play along with us at CR84FN, you can find all the details here on how to enter. If you upload to any online gallery please use keyword CR84FN48 so we can find your creations! WoW Lisa! What a gorgeous card! Love the beaded detail! So elegant and classy looking! This is stunning!!! The embossed background, the gorgeous bodice with beaded details and the butterfly wings - all fabulous! Stunning card, love all the detail on it! Beautiful wings on the corset. Love the texture on the background and the flowers details! SO elegant, Lisa! Love the winged corset and lovely gem details! Lisa, I just LOVE that Beautiful butterfly behind that FAB corset! Your coloring is PERFECT! LOVE the gems details as well! This is absolutely gorgeous Lisa!!! I love the purple and the scrolly flourishes really add a wonderful romantic touch to this! Stunning! Very chic Lisa! What an elegant image. Love the pretty beading on the dress form and those butterfly wings are FUN!! Love the shades of gray on the corset and butterfly behind!!! Coloring is fabulous and gold beads perfect!!! very pretty card, love the colors on this and that corset stamp is gorgeous. Fun and beauty put together so very perfect! You sure met the challenge. Stunning card, Lisa. What a creative use of those stamps! Love it. This is beautiful! Great combo f images! Wow! This is stunning! Love every little detail , you can see all the love that went into this card. Wonderful inspiration! Thanks!